When the construction is almost completed and,it seems that the house is ready for occupancy, the accumulated fatigue makes us close our eyes to the little things that still need attention. It was at this time, it is likely that the small "imperfections" to be postponed in the "back burner." One of these details may be the device blind area around the house. What would happen if you put it a few years? And it certainly do blind area immediately after facing the house? Apart from the purely aesthetic function deviceblind area home has a definite practical sense. The fact is that it protects the foundation from moisture penetrating the sedimentary and uneven caving. Especially dangerous to leave the building without blind area for the winter. Saturated soil moisture freezes and expands,and, consequently, it presses on the base, which can lead to its destruction. If the soil in your yard heaving, the blind area must be still warm. To divert water quality width of blind area must be at least 30 cm wider than the eaves of the roof protrusions. 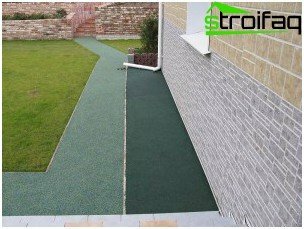 Typically, blind area is used as a walkway around the house and for the ease of use of its width should be no less than 1m. Agree, not very nice when walking to rub shoulders on the wall. The angle of the blind area should be 3-10 degrees. In order to have a result turned out great blind area around the house with his own hands, consider all options for its organization and find the best for your site. Around the perimeter of the foundation must beto partition the future blind area. To this end, the corners (both external and internal) from the wall Measure out the required distance (the width of the blind area), and trying to drive the pegs. Between pegs stretch the thick thread or string. 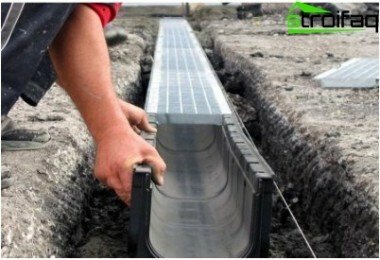 In marked section removes the top layer of soilto a depth of 0.25 m. The removed soil is desirable to remove at once, it will stop working. If your site is no holes to be filled, the soil should take. At the edge of the trench installed and fixed removable formwork. Next - a layer of gravel, 5-8 cm thick. To strengthen otmostki advisablearmirovochnuyu use a metal mesh. It should be put on the rubble and secure. When calculating the required number of reinforcing mesh do not forget to take into account that the edges when joining overlap each other at 10-15 cm. To otmostka not cracked the first winter,it is desirable to make the block. 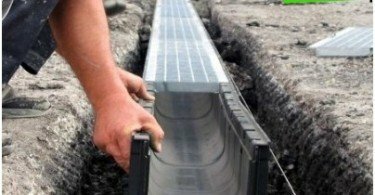 To do this, every 1-1.5 meters, set on the edge of the wooden slats, 10-15 mm thick, so that their upper edge coincides with the surface of the blind area of ​​the future. Before installing the wood needed to soak any water-repellent composition. After pouring the concrete strips of wood will serve you to align the blind area lighthouses. So, in order to facilitate further work, just install them at the required angle. Now you need to pour cement into formworksolution. You can order ready-mixed concrete on the specialized enterprise, but then need a large capacity for its temporary storage. Moreover, to cope with the process of transporting concrete from the tank to the blind area before it is virtually impossible to pour. This will require 4-6 persons. Separate preparation of the solution, of course, takes more time, but it will allow to work slowly and to save a little. When the formwork is filled with a solution, take the rule and smooth the surface. And finally, the last stage. When the solution dries out a bit, the surface should be "zazheleznit". For this purpose it is sprinkled with dry cement, which is then lightly rubbed. It only remains to wait for the drying of the solution and blind area home with his hands ready. The only drawback of the classic blind area is the fact that it must be regularly repaired. At the bottom of the prepared trench depth of 25-30 cm is necessary to put a layer of clay (about 10 cm). The next layer - waterproofing materials - waterproofing or evroruberoid. It must be pressed to the foundation with a bracket at a height of 12-15 cm from the clay level. Important! The sheet of insulating material should not be stretched. It is better to let it formed folds. Otherwise, the process of soil temperature fluctuations, it may break. Roofing felt covered with sand (5 cm). Fill the remaining space rubble. Basically, soft blind area home is ready, butit can be used only when the organized drainage on the roof. Otherwise, the water jets are cleaned regularly in the rubble unattractive grooves. 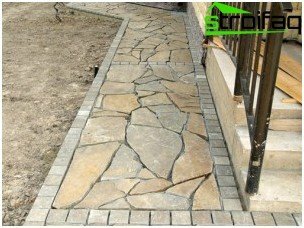 If you care about aesthetics and convenience, the gravel layer can be made slightly thinner, fill it with sand and put a light paving tiles. Important! All the layers, starting with the waterproofing should be positioned at an angle of 5-7 degrees. On sites with heaving soils otmostku anytype must be warm. 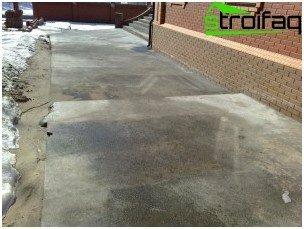 To do this, it is advisable to use a moisture-resistant insulation material - extruded polystyrene is laid under the decorative coating or concrete. Important! Polystyrene foam does not stand point loads, so it can not be used under gravel or crushed stone. So, now you know how to make a blind area homeindependently. 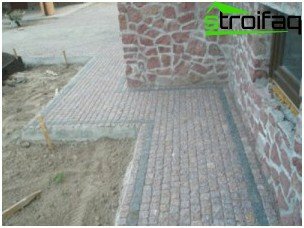 And the type of coverage and the degree of insulation to pick and choose, according to the characteristics of the soil in your yard. If you manage to pick up the coating material so that it is in harmony with the facade decoration and local area, blind area, not only to maintain the integrity of your home for many years, but will be a real decoration of the site.